Image credit: Te Whare Ra (TWR) Wines. A recent trip home for Christmas also included my first visit to the Marlborough wine region in the top of the South Island. Given I am from New Zealand this was long overdue and I was excited to see what the region had on offer in addition to the famous (or infamous depending on your point of view!) Sauvignon Blanc. It quickly became apparent that this is a region of producers who understand how to manage aromatic wines and in addition to Sauvignon Blanc I found portfolios showcasing a range of aromatic white wines, including a delicious field blend from Te Whare Ra (TWR) Wines. Te Whare Ra Wines was established in 1979 and houses some of the oldest vines in Marlborough. The words Te Whare Ra mean “home” in Maori, the language of the indigenous people of New Zealand and it fits rather well for the current owners Jason and Anna Flowerday. 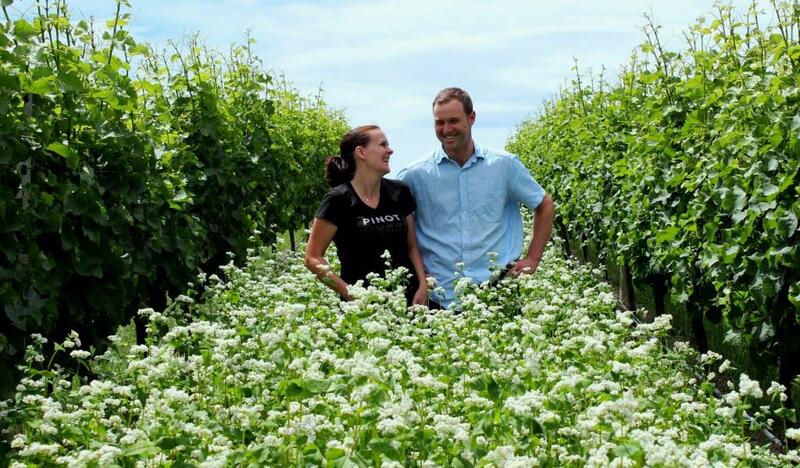 Jason returned home to Marlborough 11 years ago with his wife Anna, who he met while living in Australia, and together they took ownership of the vineyard and have been building the business since then. Image credit: Anna and Jason Flowerday. Te Whare Ra. Both are involved in the management of the winery and can usually be found out in the vineyard or pouring at the cellar door while keeping an eye on their daughters – two sets of twins – yes two! Among the quality wines produced at TWR is the Toru, meaning ‘three’ in Maori. Toru is a white field blend of Gewürztraminer, Riesling and Pinot Gris. All the grapes are hand harvested and hand sorted before undergoing a range of treatments, which affords flexibility each year to produce the best blend possible. At crushing some parcels of grapes may be destemmed, some may be whole bunch pressed while others will undergo skin contact before the juice is blended for co-fermentation. In keeping with the theme of flexibility, inoculated yeast is used to kick start fermentation on some of the juice while indigenous yeast is used for others portions and fermentation is split between stainless steel tanks and large old French oak barrels. All parcels of the blended wine spend time on lees and this gives the wine a creamy texture on the palate. Notes of stone fruit, citrus, a dash of spice together with some creamy notes from the lees contact combine to create a wine that is delicious aromatically and even better to drink – this is one for my dangerously drinkable category and given their recent award as 2014 Winery of the Year from Raymond Chan, I see I am not alone in this assessment! Love their wines! I’ve still got some ’07 Toru in my cellar just waiting for the right time to get opened. Are they still playing with Syrah as well? That was a tasty barrel sample when we popped in for a visit!